Over at Grognardia there's talk of another bandwagon around customising monsters for your setting. Orcs are a popular choice which I fully endorse as it combats YADO (yet another damn orc) syndrome. So to help YADO sufferers, here's a Neapolitan selection for inclusion into your game. One trick I use is picking out a particular aspect of the race, putting something to play against type then creating an in-game reason why that would be the case. Iron orcs were inspired by the brutal treatment afforded certain smiths in legend and history. Wild orcs are a mashup of Apache and wilderness survivalist. Mine orcs were inspired by a TV show about mole rats. A race of treacherous mercenaries, fighting dirty for the highest bidder anywhere. Burly and thickset from a life of battle, they use shields and formations, favouring polearms, blades and crossbows. Arms and armour are status symbols to iron orcs, who always seek the best. Some iron orc chiefs enslave smiths to make arms and armour for their tribe's personal use. Others use torture to learn smithcraft. Iron orc-crafted weapons are jagged and effective if lacking aesthetic appeal. Iron orcs set up simple fortified camps and keep moving between war fronts. A grimy, stooped orc with fine black hair, tiny reddish eyes and unusually large hands. Even for orcs, they are hard of thinking. Mine orcs use hammers, picks and spears in battle but typically dig with basic implements. They sniff the air if meeting something new. Bright light hurts their sensitive eyes, they have a talent discerning underground phenomena. They take slaves races to work in the mines except elves who are slaughtered and eaten as delicacies. When they rest, they gather to sleep in a large pile of bodies to share warmth. 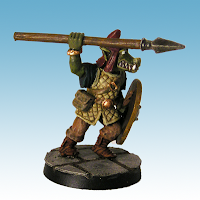 A lightly-armoured orc with dappled greenish-brown skin, they are skilled hunters, runners and trappers in wooded hills and mountain bluffs. They wear furs and simple dyed hides. Wild orcs favour the spear, bow, axe and knife, using weapons equally well for hunting and killing. They domesticate wild dogs for guarding, hunting and tracking. Adept at trapping beasts like elk or human some work as guides though treachery is possible. They favour nocturnal hunting, taking to bivouacs in the high sun. A nice vasriety of orcish variations. You can never have enough orcs. Never. When it comes to orcs, there is only sufficient.